We exist to get Green Party policies put into action by campaigning and by getting people elected at all levels of government. We also run meetings where you can discuss policies and get to know other like-minded people. We're a friendly bunch and you'll enjoy working with us for a better world. For Green Party Policies, see the Green Party's policy site and for other news and information about the Green Party nationally see The Green Party website. For what is happening locally see News, Elections, Get Involved or Campaigns. This site was established in February 2013 and will have further information in due course. 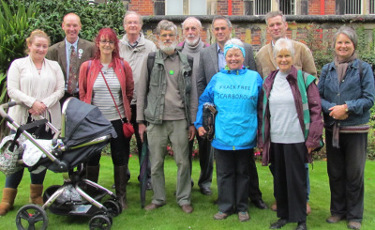 There is also a website for the Green Party in Yorkshire and the Humber and the Green Party in North Yorkshire.